If there’s one thing that unites all outdoors pursuits, it’s the pressing need to eat like a horse at the end of the day. Unless you’re planning to live on nuts and snickers bars, this means you’ll be needing a decent stove to cook your dinner on. As you you'll see from our best camping stoves buyer's guide, the options vary from sizeable ranges that’ll need a car and a team of sherpas to shift, through to the 11g Esbit, which is pretty much unbeatable in terms of weight. This all means you really need to pick the tool for the job in hand, but if you’re looking for a jack-of-all-trades, there is a central core of ‘do anything’ stoves that should be on your list. These include the MSR Pocket Rocket 2, Primus OmniLite Ti and MSR Windburner, all of which are covered here. Our favourite all-round best camping stove at the moment is the Primus Kinjia Camping Stove. The best camping stove for you will all depend on your needs: the size of your group, what you’ll be making in it, what time of year you’ll be going camping and at what altitude, and whether or not you need something that can face up to wind. So it's always best to decide what you will use your camping stove for more frequently before you begin. When it comes to weight, think about how much walking you’ll be doing: if it needs to go in a pack, think lightweight and collapsable; if you’re taking a car, go as heavy as you can for added power. 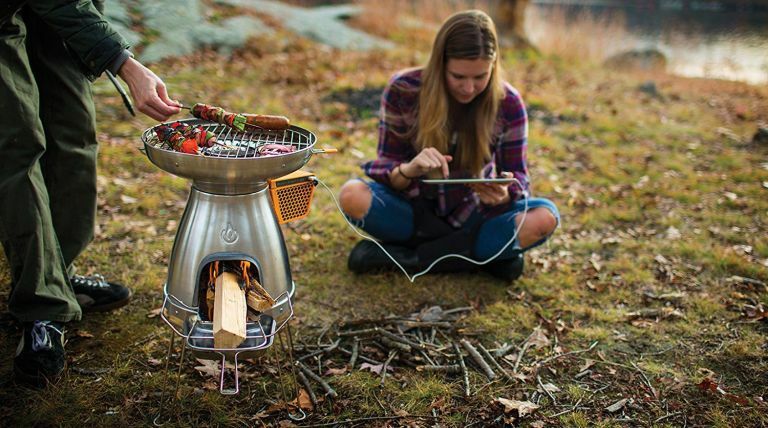 Camping stoves range from small, compact styles that fit snugly into the smallest of backpacks right through to large kitchen style hobs that attach to gas canisters and are fit to prepare a family feast. On a related note, alongside style, there’s stability, because as anyone who’s had the misfortune of experiencing it will know, knocking a full dinner on the floor can be devastating. Be careful to consider how stable you need your camping stove to be; if you've got little ones running around your camp, you may want to avoid lighter travel camping stoves and opt for a stronger tabletop alternative instead. If you’re taking dehydrated food along with you, or you’ll be melting snow for drinking water on winter trips, you might only need a stove with boiling capabilities, while for more complicated fare, a stove that cooks is in order. When looking for fuel types, the big trade-off is the time spent priming: priming is essentially pre-heating, and while it’s not a requirement for canister stoves, most liquid fuel and alcohol stoves need it to get going. Integrated canister stoves are the best all-rounders for high altitude, for the fact alone that they deal well with wind, which stops most other stoves in their tracks. This 3-season camping stove from Primus is our best all-rounder, and strikes exactly the right balance between capacity and compactness, solidity and lightness. It’s well-made from high-quality materials and able to accommodate medium to large pans, but is incredibly easy to pack and carry, as are its small canisters. It’s simple to set up, the flame stays consistent to the end of the container while cooking, and when you’re done, the drip tray and grids remove for easy cleaning. A classic stove choice, the MSR Pocket Rocket stove has been a popular choice for years, and the revamped version in this excellent set will certainly deliver the goods. The included 0.75 litre aluminium pot is simplicity itself, with some neat features, such as the pot lid doubling as a strainer, included tongs to handle hot pots, and of course being the right size to contain a small gas canister to minimise packing bulk. In a similar vein, there is an an additional bowl which fits over the pot snugly to really pack in the cooking options. At a tiny 278g this is an excellent, low faff but lightweight option for solo cookery on the trail. Designed specifically for snow expeditions, the Snow Peak GigaPower stove is peerless at high altitudes and in low temperatures. It has a really powerful output which is ideal for very frequent use, especially when melting snow for drinking water, and a large wind screen to defend against extinguishing gusts, while its expandable trivet gives it the ability to host different pan sizes for maximum versatility. The downside: as you’d expect for the specialist-level performance, it’s phenomenally expensive, definitely one for extreme adventurers. Although gas is super-convenient, sometimes liquid fuel is all that’s available. Liquid fuel stoves can usually burn anything including gas, gasoline/petrol, diesel, kerosene/paraffin and aviation fuel, so for more remote expeditions they’re a real essential. You don’t need to be headed to the Karakoram for a liquid stove to be useful though, as the fuel is often cheaper than gas canisters, less bulky and more weight-efficient over long periods or when cooking for small groups. The OmniLite Ti is the lightweight sibling (350g) of the OmniFuel, a veteran of many an expedition and a time-proven, field-fixable bombproof heating machine. With a selection of jets for different fuels, an ingenious folding construction and a flame control that is easily operated wearing gloves, this is a serious stove for serious occasions. Buy one and you’ll never need another stove, it’s that simple. This suitcase-style portable stove looks great, and packs an impressive amount of performance into a budget price. Its removable grill tray adds versatility, so whether you’re in the mood for grilling or boiling, it can deliver — it’s easy to clean, too. It also has a side wind shelter, for keeping out pesky breezes that might threaten your flames. In short, it’s an excellent value griddle-meets-stove, to handle a range of tasks on the road or in the garden. This Esbit offering is a handsome retro-style stove for minimalist travellers who like to pack light. The titanium construction makes it incredibly light to carry, and its foldable legs make it compact and easy to pack, ideal for stowing in a pack during climbs or hikes. It’s customisable, to be used with a range of pot sizes, and smaller cups can rest on its edges. Unfortunately it doesn’t have a windbreak, so it’s not great for windy days — if this is more of an issue than portability, look to the SunnGas Platinum as an alternative. We could all be forgiven for thinking that camping stoves aren’t the most future-facing bits of kit around — but in the case of the Bio Lite stove, you might be surprised. Not only can it grill, cook and boil, offering unparalleled flexibility, it includes its own USB-powered FlexLight for after-dark dinners, and another USB output for charging your devices. It’s also light and compact to carry, with the added bonus of running off wood, meaning you don’t have to allow space for fuel, either. As you might have guessed from the name, the MSR Windburner’s biggest selling point is that it stays lit even in windy conditions, so it’s perfect for climbers, hikers, and those brave souls who like to go camping nearer the end of the year. The ‘loct pot’ design is great for retaining heat when it’s chilly outside, and the insulated cosy with handle means you can carry it around without accidental burns. The burner’s very efficient, too. If you’re looking for a camping burner for your next extreme trip, but balk at the expensive Snow Peak GigaPower, this is the one for you. Jetboil’s latest iteration adds neat touches to a well established line of stoves with plenty of imitators. The real standout benefit of a Jetboil-style stove is the speed - there might be quicker boiling stoves with bigger heat outputs, but the Jetboil is the quickest way to get from zero to cup-of-tea this side of a samovar. The Flash adds in a colour-changing sleeve that shows you when the contents are hot - handy for avoiding casual burns - and retains the flux ring and inbuilt piezo igniter of older models. Although limited in terms of the cooking you can do (frying is pretty much out), the Jetboil will deliver boil-in-the-bag and rehydrated meals in a flash. Indeed, the company claims you’ll have hot tea for two inside two minutes - can’t say fairer than that. The Campingaz Bistro 300 is the ideal stove for festival-goers and fair-weather campers, with its user-friendly design, low price, and easy set-up. Ludicrously simple to use, it’ll be familiar to anyone who’s used a gas hob at home, so it’s a good buy for teenagers heading off to their first Glastonbury. The single burner requires some planning around, and it doesn’t feel terribly sturdy, but that’s understandable for the price. It’s not, however, recommended for prolonged use, so for a longer-lasting burn, consider the SunnGas Platinum instead.